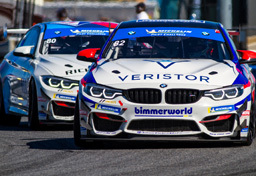 In what can only be described as the closest example of “trial by fire,” BimmerWorld’s drivers and crew faced a menacing foe last weekend at New Jersey Motorsports Park – temperatures near 100 degrees and stifling humidity – that made placing both cars in the top-5 that much more rewarding. But getting both of their cars into the race, as the BimmerWorld/GearWrench team found out, was more than half the battle. After suffering a crash in practice after a tap from behind by a GS-class car, the No. 81 BimmerWorld/GearWrench BMW 328i required a massive about of repairs, led my BimmerWorld’s veteran crew chief, Jason Marks, and more repairs were soon to come with the sister car. The sense of relief for Marks and the No. 80 crew was easy for all to see, and for the drivers of the GearWrench-sponsored car, their second-place finish at New Jersey was a major accomplishment. Not only did team owner/driver Clay and Continental Tire Sports Car Challenge series rookie White reward the miracles their crew performed, they also broke through to earn their first podium of the year – something White says has been long overdue. For Clay, the satisfaction from their NJMP podium comes from realizing their potential with a very capable result. If one aspect of landing both BimmerWorld/GearWrench entries in the top-5 impressed Clay the most, it was how effectively the team administered the event. Reacting to a major car rebuild to begin the weekend was hard enough, and starting behind the proverbial ‘8 Ball’ could have seen both cars suffer come race day, but that’s not what happened. Behind the charge led by the No. 80 BimmerWorld/GearWrench car, championship leaders Seth Thomas and Bill Heumann made all the right moves to add to their points total. With a scant 1-point lead in the season championship entering New Jersey, Thomas and Heumann made the most of tough race to take fifth, extending their points lead to 13 by the checkered flag. But Heumann, leading the MESCO Rookie of the Year championship as well, says that when it’s time to go racing, thoughts of points and championships quickly fade away. Like his teammates, Thomas attributed his result to the BimmerWorld/GearWrench crew. With a 13-point lead in the driver’s championship (238 to 225) for Thomas and Heumann, a stronger position in the same championship or Clay and White (sixth) thanks to their NJMP result, and a 13-point lead for BimmerWorld/GearWrench in the team’s championship, both entries head to the penultimate round at Trois Rivieres in Quebec, Canada, on August 14th ready for whatever challenges they may face. If New Jersey proved one point, it’s that there’s no quit in the BimmerWorld/GearWrench team. 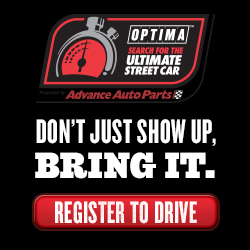 The broadcast of the Garden State 250 from New Jersey Motorsports Park can be seen on July 25th at 1 p.m. 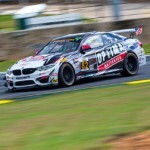 ET on SPEED, and be sure to follow the team at www.BimmerWorldRacing.com.